My Easy Cassoulet is a pared down version of the classic French dish and it’s perfect for laid back entertaining or a romantic dinner for two! *This post is in association with Swanson® ~ thank you for supporting my brand partners, I only work with brands I know and love, and they help keep tvfgi up and cooking! Holiday entertaining isn’t all about glitz and glam, at least not in our house — I love it when friends and family come in from the cold to gather around a simple comforting meal, let’s call it festive casual. 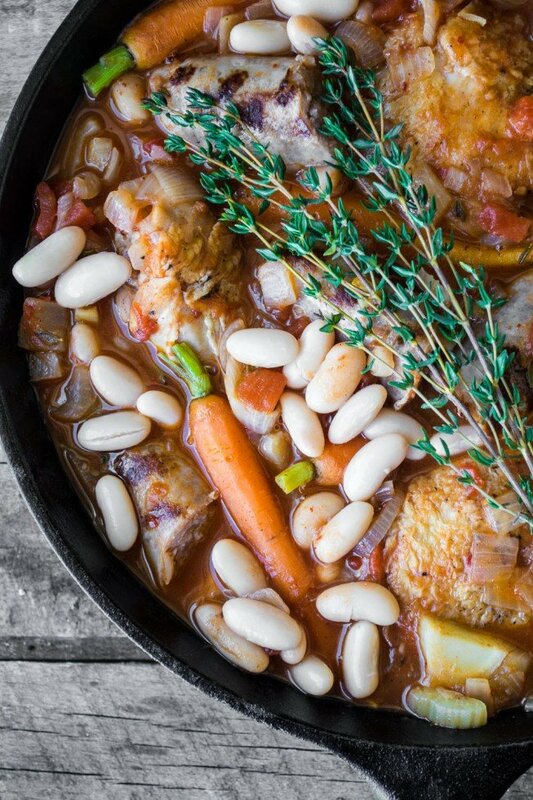 No invitations, no place cards…just an big pot of something fabulous like this Easy Cassoulet plopped down where everyone can help themselves. But serving classic comfort food to guests can be a little tricky. We love the welcoming, homey quality that makes it so universally appealing, but comfort food can be be, well, dowdy. My simplified cassoulet solves that problem. I’ve pared down a complex and time consuming traditional dish to a more manageable form, while keeping what makes it special — those distinctive country French flavors. It’s the kind of dish that rallies people round and makes everybody feel warm and cozy. Put on your Ugg boots and your best yoga pants and come on over. This dish can actually be made from start to finish in about an hour. But it really gets better with time, so you can feel good about making it ahead. I have a few secrets for making homey stews like this one a little more presentable for party time. 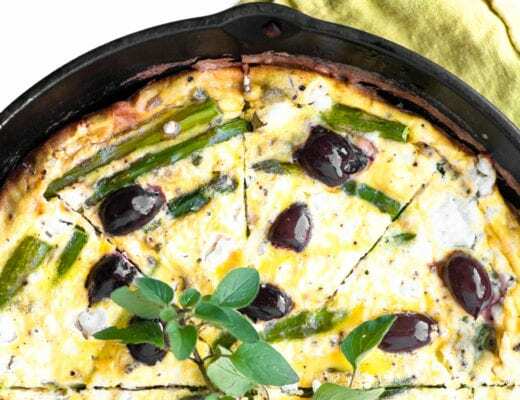 I like to cook it in a large pot on the stove, but I will transfer it to a casserole dish or a rustic skillet for serving. That allows me to re-arrange everything for a prettier presentation. A scattering of fresh herbs, in this case thyme, is essential to brighten up the cassoulet. And I always make sure to have a few vividly colored ingredients, like my carrots, front and center. *This post is in association with Swanson® ~ thank you for supporting my brand partners, I only share brand I know and love, and they help keep tvfgi up and cooking! 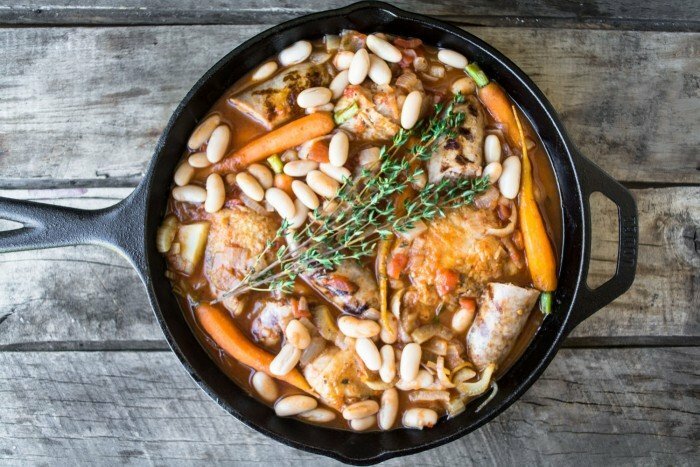 Cassoulet is a country French dish that features sausage, duck, sometimes pork, and white beans. It’s really a peasant style meal that has grown more complicated over time. My dish is a nod to its simpler roots. I use Italian pork sausage, either hot or mild, and chicken, along with onion, shallot, garlic, fennel, and carrots. Then there’s lots of white beans (canned for ease) and fresh thyme. The sauce is made with chicken stock and tomatoes. I use Swanson® stock because it’s the best substitute for homemade I’ve found. It forms the backbone of this dish, so it’s essential to use top quality. 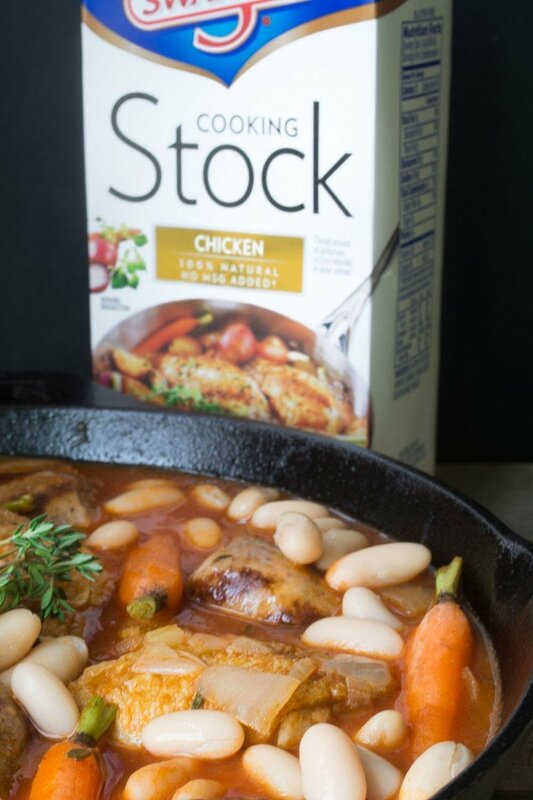 Swanson® Chicken Stock is the perfect cooking base for the cassoulet because its rich and savory roasted chicken flavor blends well with, and brings out the best in, the other ingredients. I’ve taken a few liberties with tradition and introduced some Moroccan inspired elements to this dish. A touch of harissa, which is a spicy red pepper paste, lends a bit hint of heat to the mix. And a pinch of cinnamon and allspice gives the sauce a beautiful depth. In fact the sauce is so good it’s essential that you serve some sort of crusty bread alongside the cassoulet so not one drop of it will go to waste. Heat a grilll pan over medium high heat until quite hot. Prick the sausages all over with the sharp point of a small knife. Brush them will olive oil and place them on the grill. Brown on all sides and set aside. Do the same with the chicken pieces. Heat a large Dutch oven or heavy stew pot and coat the bottom with olive oil. Saute the onions, shallot, fennel, and whole garlic cloves for about 10 minutes, stirring often, until softened. Add the vermouth to the pot and let it cook down for a couple of minutes. Add the tomatoes, tomato paste, and stock, bay leaves, thyme, harissa, and spices, stir well and bring to a simmer. Let the sauce cook uncovered for about 10 minutes to reduce a bit. Add the sausage and chicken back into the pot, and nestle down into the sauce. Cover and let simmer on low for about 20 minutes. Add the white beans and the baby carrots at the very end of the cooking, just so the carrots barely cook through. Add the sherry vinegar and taste to adjust any of the seasonings. Remove the bay leaves and the thyme bundle. Cut each of the sausages in half. Garnish the cassoulet with fresh thyme leaves. Serve hot with crusty bread. Browning the sausages and the chicken not only develops flavor, but also adds color, which helps make an appealing dish. I was conservative with the amount on the spices, go for a little more if you like. Even though this cassoulet is fairly quick cooking, there are a few elements I hold out until the end because I don’t want them to get mushy. I add the beans and the carrots at the very end of the cooking. The beans will retain their shape and bright white color that way, and the carrots will cook just enough to be tender but firm. If you make this ahead, the sauce may thicken after it has been refrigerated, just add more Swanson® stock as you reheat it. 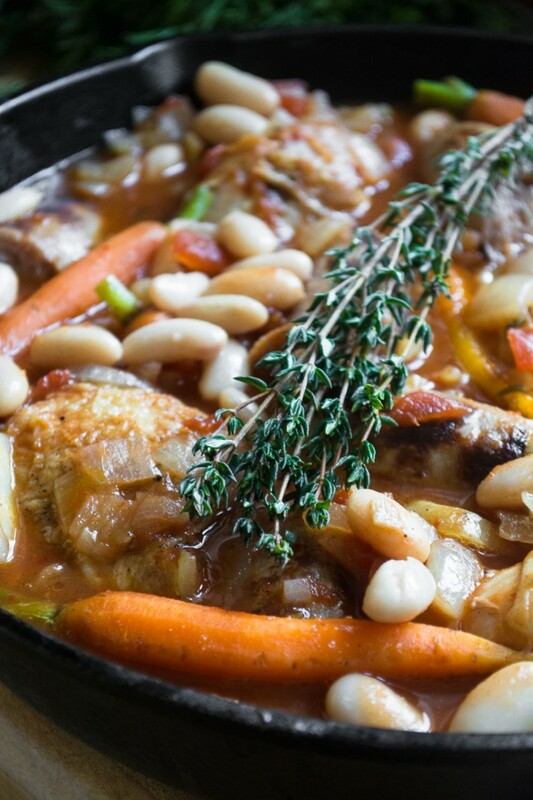 Don’t forget to pin this easy French Cassoulet! I hope you’re following along with me on Pinterest! Follow The View from Great Island’s board The View From Great Island on Pinterest. This is such a hearty and comforting dish. This would be good any time of year. This looks fabulous, Sue. Love recipes like this…..they taste even better the next day or two. Great presentation tip too! This looks like a nice and hearty meal for the cold weather. Perfect comfort food. This looks so delicious. I have a couple of company’s coming casseroles that I really love to serve,but I think everyone has had them both a couple of times. Time to add this recipe to the winter rotation.Thanks for the inspiration! I’m ready to come on over for some of your cassoulet! Are pj pants ok? I can almost smell those yummy Morocan spices. Thank you for sharing! Yes to the pj pants!! Had to go to my laptop to comment! I think the problem must be with my other computer because things are working just fine on the laptop. 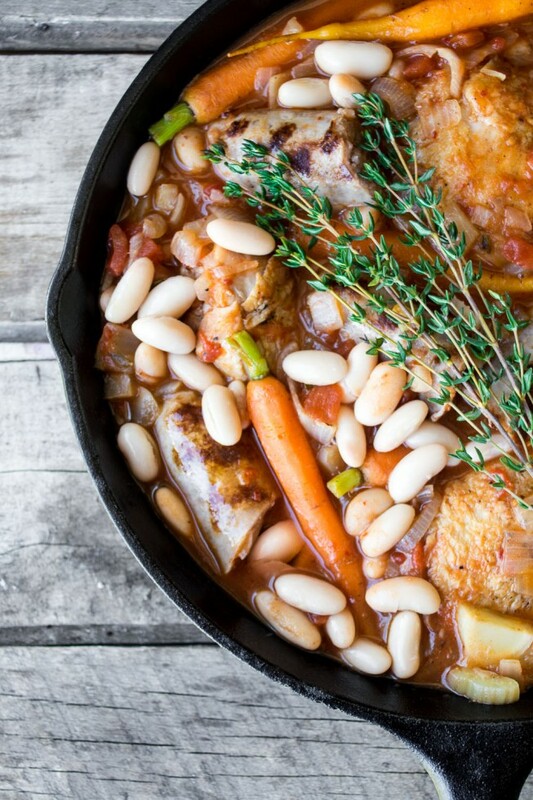 Love this delicious cassoulet. I’m all for casual and comfy and this sounds like a delightful comfort food meal! Love the pics! I’m coming over to celebrate, wearing my festive casual clothes. So perfect and so is this cassoulet. Love it! :) Have a great holiday season Abbe! Cassoulet is a favorite in my family. It would be perfect over the Christmas holiday and I’m sure it’s one of those recipes that is even better the second day. I hope you and your family have a very Merry Christmas and a Happy New Year. Thanks Cathy — you too! Sue, I want this for dinner today! I definitely prefer chicken to duck for this, and I like that you included both breasts and thighs to make everyone happy. You can use whatever chicken parts you want, I would just cut bigger pieces in two so everything cooks evenly. What a delicious one-dish meal! That’s a true comfort food, and I love how it can be made in advance and gets even better with time! I do like your term festive casual. Not so fond of you disparaging those of us who make our own stock though. Why wouldn’t you want to know and control exactly what’s in your stock? It’s also a great way to get a second round out of your leftover bones and bits when you roast a chicken. I don’t know how you make stock but it’s a very simple process and takes very little effort to do. The base ingredients are ‘free’ and you are re-using/recycling them. I love “homey” dishes to serve family and friends. No fuss, no mess and folks are bonding over a great meal. I love your idea about preparing it ahead of time to improve the flavors, and then dressing it up a bit for presentation. Love it. Thanks Velva, I think it’s important to comment on how to prep it for serving because sometimes food in photographs can look really different from the result you get from following a recipe. I know how frustrating that can be. Festive casual is my favorite way to entertain (great name, btw). I love how comforting this looks, and anytime I can get a great meal that is not complicated I am on board. Pinning! Sue this looks so comforting and the photos are stunning. Yes I’d like to stop by with my Uggs and most comfy sweats for a bowl of your cassoulet. Looks fab! I agree, Swansons is the only way I go if I’m not making my own. Quite frankly, who has the time? Thanks Vicki — and I agree, who in the world makes their own stock nowadays?? I’ll share if you will? This looks so warm and comforting and with some fresh snow outside, will be a welcome addition to my table soon! I just want to dive into that pot, wish a spoon of course. It looks irresistible! What an absolutely perfect meal. Love the beans and vegetables and I’m a big fan of Swanson’s! Beautiful photos Sue – you are a creative genius with those spices! Thanks Tricia, those little extra spices do make a difference. My kind of food! And love how simple it is — who has time to make duck confit? :-) Great pictures, too, particularly the top one. Love the carrot! 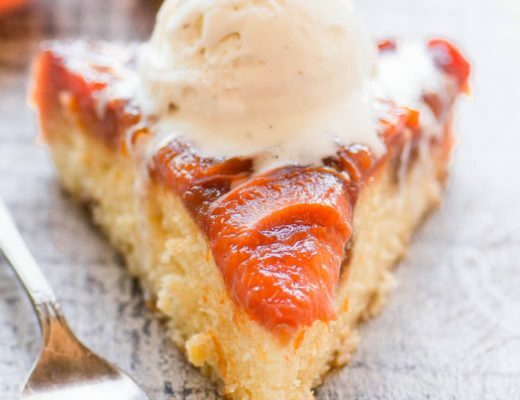 Oh my – this is a lovely, easy version! I love how you spiced it. I am comforted just reading this! 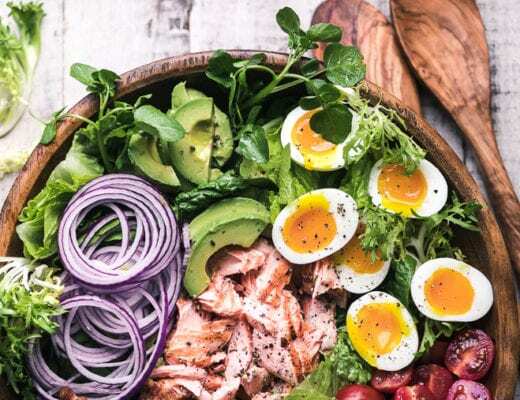 This looks fantastic, a perfect dish for every day but it would also be wonderful for a dinner party. I’m sure the Italian sausage enhances the flavor of everything! Pinning! Thanks Chris, I made it twice, once with sweet sausage and once with hot, both were great! what a gorgeous dish and photo! This looks so rich and comforting! Perfect winter food! Perfect comfort food and I agree – festive casual is the best!